STOP! 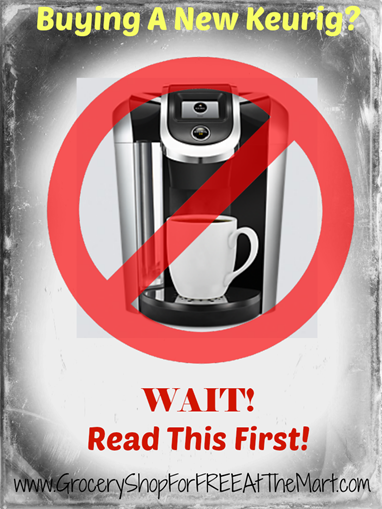 Don’t Buy a New Keurig Coffee Maker Before Reading This! The first thing you need to know is that before now, we were huge Keurig fans. I still prefer the old fashioned pot of coffee but my wife is a much more modest coffee drinker so being able to make one cup at a time is a great fit for her. We are on our second Keurig, having absolutely worn the first one out last year. So when the new Keurig 2.0 was announced, I knew it was only a matter of time before we owned one. If you aren’t familiar, the new Keurig system has space to hold 4 K-Cups at once so you can make an entire pot instead of just one cup at a time. I figured this would be the thing that would finally make me throw away the old coffee maker I have had for years and make the switch over to be a fully Keurig-only family. I am SOOOO Glad I Did Some Research! Turns out, that would have been a disastrous decision financially. You see, Keurig name-brand K-cups are pretty expensive so we rarely buy them. Instead we buy the much cheaper bags of Starbucks coffee, (You know your prices on coffee are crazy when Starbucks can beat you) have the barista grind it really finely and then use a refillable pod to brew Dian’s coffee in the morning. It’s economical and makes a fantastic cup of coffee. Unfortunately, Keurig didn’t like that people weren’t buying their licensed Keurig K-Cups so with the new 2.0 system, there is a DRM-style lock that makes it impossible to use an after market brand of K-Cup. This means that our current way of making coffee would not work and we would have to go with the far more expensive “official” Keurig K-Cups in order to make coffee. It get’s even crazier when you know that even older official Keurig K-Cups won’t work if they don’t have the new DRM information encoded in them. Do you have a stockpile of K-Cups? Kiss them good-bye. The worst thing about this change is that this information is not readily available on the box. There are going to be a TON of people who are going to open up up new Keurig 2.0 coffee pots this Holiday season and not be able to make a cup of coffee and have no idea why it won’t work the way they think it should. So now you have been warned. If a new Keurig coffee pot is on your shopping list, just know that you are going to have to invest heavily in the official Keurig K-Cups in order to get it to actually make coffee. I know that there is no way this will ever happen in my house. If our existing Keurig ever goes kaput, it will be back to the old Mr. Coffee that isn’t as fancy but at least it makes coffee when I want it to. Looks like there is a workaround if you are willing to go through the trouble. Checkout this video.